With the Calgary municipal campaign just around the corner Armadillo Studios is proud to announce the launch of James Maxim’s 2013 campaign for Ward 11 Councillor. 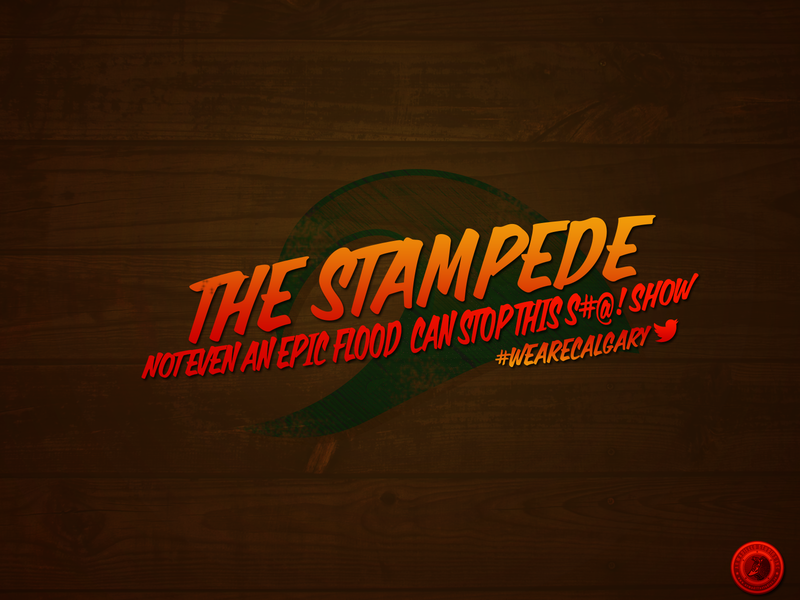 Every July since 2009, Armadillo Studios has been crafting a set of humourous wallpapers to celebrate the always endearing “Calgary Exhibition and Stampede”:http://www.calgarystampede.com/. For better or worse, The Calgary Stampede is one of the defining elements of Calgary’s culture and identity. For many of us, it’s a huge aspect of our city’s stereotype and indentity and because of which it is always ripe for some good old fashioned ribbin’. And as I have done for the past few years, early last week I put out a call for sone witty suggestions for this year’s editions of the Wallpapers. We got sone great ideas and we had come up with a few witty ones ourselves. 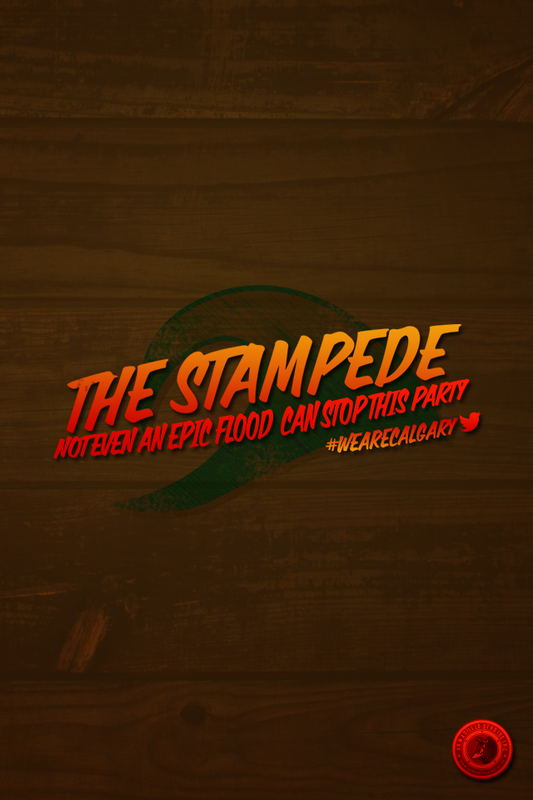 With a province and a city literally decimated by mother nature’s wrath and thousands of people looking to rebuild and regroup from the devistation, making fun of the Stampede just doesn’t seem right this year. Now many are already debating whether or not the Calgary Stampede should actually take place this year, with less than ten days from the parade kick-off. But like the “Calgary Stampede organizing committee”:http://www.ctvnews.ca/canada/calgary-stampede-will-go-ahead-come-hell-or-high-water-president-1.1339295 and “many others”:http://metronews.ca/voices/krause-encounters/717057/why-the-calgary-stampede-must-go-on/, I believe that the city needs the Stampede (in whatever capacity possible) this year more than ever. After times of disaster and crisis, communities need a rallying point. A few months ago, Boston needed the Bruins and a few years ago New Orleans rallied around the Saints. 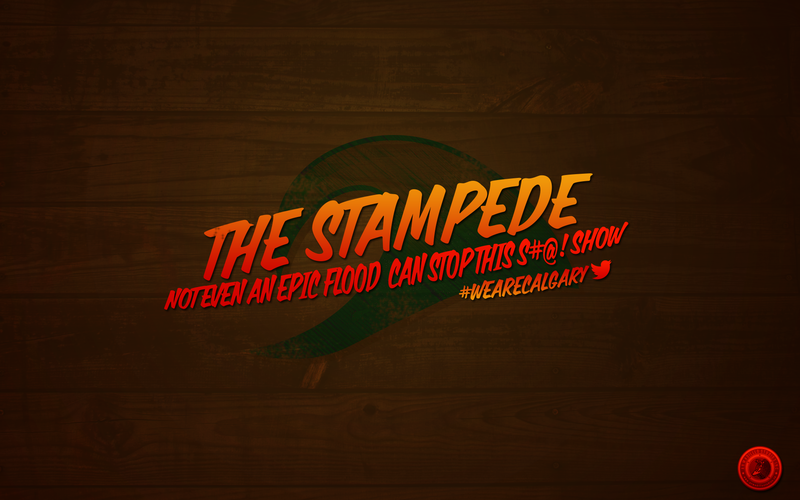 This is why at this time, the city needs the Stampede. Now for most cities, putting on something like the Stampede is a gigantic and daunting task, to do it after the largest disaster to hit the region in over a hundred years would be near impossible for most communities. But this Calgary and it’s a beautiful beast of a city. If anyone can do this, it’s Calgary and the amazing people of this city. So in solidarity with the rebuilding of our beloved city and the great spirt of the thousands of volunteers and people all over this province, we’ve created a special Stampede Wallpaper this year. *Now*, If you do decide download the wallpaper *please consider* donating to the “Canadian Red Cross on behalf of Flood victims”:http://www.redcross.ca/Donate/Donate-Online/Donate-to-the-Alberta-Floods or joining the “yycHelps.ca”:http://www.yychelps.ca/ project, spend sometime with your neighbours cleaning out or even pick-up “the Hell or High Water T-shirt”:http://store.calgarystampede.com/products/hell-or-high-water or buy “The Nenshi Bad Portraits Print”:http://badportraitproject.com/floodrelief.cfm. Let’s all band together and make rebuild this city. *For those looking for the lighter versions* feel free to download the wallpapers from “2011”:https://www.armadillostudios.ca/stampede-wallpapers-2011-carnies-edition/ or “2012”:https://www.armadillostudios.ca/stampede-wallpapers-2012-stampede-centennial-edition/. This post has been re-posted from Armadillo’s President’s personal web site as it touches upon a subject that we’re currently very interested in. We hope you enjoy this post and if you have any questions feel free to contact us at any time. Once again the Canadian Political world has been confronted with the always comical debate surrounding Political Ads. The recent spat over the infamous _In Over His Head_ Justin Trudeau spots and the nitty gritty provincial “battle in British Columbia”:http://blogs.canoe.ca/davidakin/bc-politics/bc-liberal-candidates-star-in-hard-hitting-anti-dix-attack-ad/ have resurrected this timeless argument. And yes, if you asked most Canadians they would tell you with no uncertainty that they despise this level of political dialogue, while secretly not wanting to admit that these tactics _can_ work like a charm. But low and behold, there is a new form of Political Attacks Ads that has quietly surfaced that is even more pathetic and lame. That of course is the world of the dreadful _Political Attack Web Site_. Yikes, where has time gone? It feels like only yesterday we were celebrating the end of 2012 and the beginning of 2013, now we’re thirty days into the new year. Well, it’s time to get back into the groove of things again with our first _Nine-Banded_ post of 2013. Where Is The ‘Design’ in Canadian Political Web Design? I know it’s a bit of a cliché, but when talking about the advancements in campaign technology and design one cannot underestimate how much “Barack Obama’s campaign team has brought to the industry”:http://www.barackobama.com/. Whether it was the revolutionary techniques and concise planning employed by the campaign team in 2008 or the “impressive data-driven objectives set out by the 2012 re-election team”:http://www.theatlantic.com/technology/archive/2012/11/when-the-nerds-go-marching-in/265325/. Either way the ground work laid out by _The Obama campaign machines_ in both elections has ushered in a new era within the political world and has essentially set the standard for the importance of a candidate’s online presence.